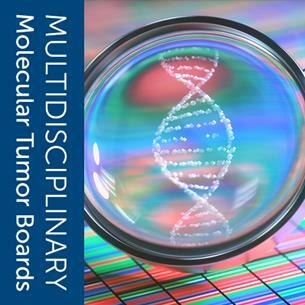 Welcome to the Molecular Oncology Tumor Board Series! This educational initiative is a collaboration between the American Society of Clinical Oncology (ASCO), College of American Pathologists (CAP), and Association for Molecular Pathology (AMP). A new case will be presented each month with discussions led by an expert pathologist and medical oncologist. This month’s topic is led by Drs. Danielle Shafer (Virginia Commonwealth University) and Daniel Arber (Stanford University). Users are encouraged to leave comments and post questions about the case in order to generate a wide discussion among the cancer care community. You can also receive email notifications when new comments are posted by clicking the “Follow this Conversation” option located at the bottom of this page. Please see below for supplemental resources related to the case. Medical History: Patient reported one week of increased gum swelling and bleeding requiring modifications in his diet. He saw his dentist who ordered a CBC. He was then sent to the ER for an abnormal CBC. He had been well prior to admission to the hospital. Physical exam was remarkable for gingival hyperplasia as well as 1-2 cm bilateral cervical and submandibular adenopathy. 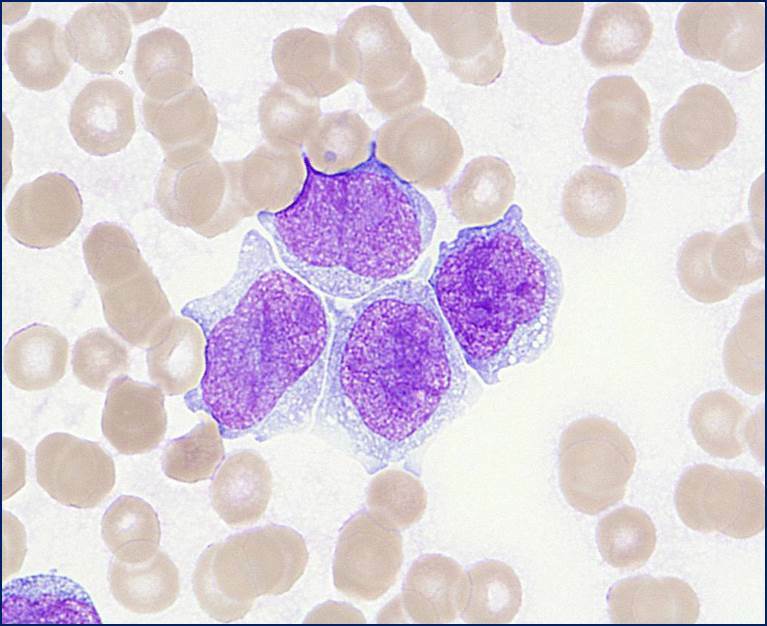 Review of the peripheral smear demonstrated frequent blasts and promonocytes. Immature monocytes and neutrophils with hypersegmented nuclei and occasionally with hypogranular cytoplasm were present.. There was a macrocytic anemia with anisocytosis and a moderate thrombocytopenia with hypogranular forms seen. He had a white count of 29.2 K/uL with circulating blasts, hemoglobin of 8.7 g/dL (MCV 117 fL) and platelets of 102 K/uL. On the differential, there were 40% segmented neutrophils, 23% lymphocytes and 27% monocytes. Renal and hepatic function were with normal limits. LDH was 283 with a uric acid of 8 mg/dL. CT neck demonstrated multiple enlarged cervical nodes. The largest, a right level II node, measured 14 x 17 mm. Emphysematous changes were noted in the lungs. Initial bone marrow was hypercellular (90%) with 55% blasts/promonocytes. No significant dyserythropoiesis was identified. Scattered hypogranular neutrophils were present, similar to those in the blood, but were less than 50% of granulocytes. Megakaryocytes were decreased, but normal in appearance. By flow cytometry immunophenotyping, the blast population expressed CD4, CD11b(variable), CD13(variable), CD14(partial), CD33, CD45(dim), CD64, HLA-DR (variable) and MPO(dim). FISH with normal probes for -5/5q-, -7/7q-, +8, 20q-, t(8;21), KMT2A (MLL) rearrangement and inv(16). 1. What is the appropriate World Health Organization (WHO) diagnosis for this case? 2. What is your initial approach to treatment? 3. What is the role of bone marrow transplant in this population? ad 2. clinical trial or 3+7 regimen outside of a clinical trial followed by standard HiDAC consolidations x 3.
ad 3. if in CR, would not perform allo SCT in CR1 because he has 40-50% chance of cure without allo SCT and has some comorbidities (emphysema). If not in CR or early relapse, would proceed to allo SCT. Thank you Dr.Wolfram Brugger. Clinical trial would definitely be our first choice in the treatment of flt3 mutated AML. In the US, flt3 mutated patients without significant comorbidities are offered transplant in CR1 given the increased risk of relapse and adverse impact on overall survival. Based on the provided information, this case would be considered as acute myeloid leukemia (AML), not otherwise specified (AML, NOS) in the 2016 World Health Organization (WHO) classification (1). The WHO classification is based on international collaborations between pathologists, hematologists, oncologists and geneticists, and use of the classification is currently preferred to ensure consistency in diagnosis. While the diagnosis of AML, NOS is a diagnosis of exclusion, it is appropriate in this case because of the lack of history of prior therapy (ruling out therapy-related myeloid neoplasm), lack of prior myelodysplastic syndrome or myelodysplastic/myeloproliferative neoplasm, lack of a myelodysplasia-associated cytogenetic abnormality and absence of background multilineage dyspoiesis (ruling out AML with myelodysplasia-related changes), and the lack of a recurring cytogenetic abnormality or mutations of NPM1, CEBPA or RUNX1 (excluding categories of AML with recurrent genetic abnormalities). The morphologic features as well as the reported expression of partial CD14, CD64 and dim MPO would support the AML, NOS subtype of acute monoblastic/monocytic leukemia. Mutations of FLT3 in AML most commonly represent internal tandem duplications (ITD), but 20-25% of mutations are point mutations in the tyrosine kinase domain (TKD) (2). The presence of a FLT3-ITD mutation does not impact the pathologic diagnosis, because such mutations may occur across a variety of distinct AML categories, including acute promyelocytic leukemia with PML-RARA and AML with t(6;9)(p23;q34.1) (DEK-NUP214). Mutations of FLT3-ITD in AML are particularly common in association with a normal karyotype, present in up to 30% of such cases, and most of such cases meet criteria for AML, NOS. Because of the prognostic significance of FLT3-ITD mutations and allele burden (2-4) in AML, especially cases with a normal karyotype, such testing is still recommended in the evaluation of most, if not all, cases. The prognostic significance of FLT3-ITD mutations in AML is impacted by the presence or absence of associated molecular genetic abnormalities, such as the mentioned PML-RARA fusion or cooperating mutations. The 2016 WHO AML, NOS category no longer includes cases with mutations of NPM1, RUNX1 or biallelic CEBPA mutations, and the AML, NOS subtypes have no prognostic significance when these mutation categories are removed (5), in contrast to the prognostic significance of FLT3-ITD detection and allele burden in this group. 1. Arber DA, Orazi A, Hasserjian R, , et al. . Blood. 2016;127(20):2391-405. 2. Kottaridis PD, Gale RE, Linch DC.. Br J Haematol. 2003;122(4):523-38. 3. Pratz KW, Sato T, Murphy KM, et al. Blood. 2010;115(7):1425-32. 4. Linch DC, Hills RK, Burnett AK, et al. Blood. 2014;124(2):273-6. 5. Walter RB, Othus M, Burnett AK, et al. . Blood. 2013;121(13):2424-31. Typically, patients with FLT3-ITD AML present with a large disease burden, which manifests as leukocytosis and a high percentage of bone marrow blasts. In younger AML patients with FLT3-ITD mutations, remission rates are generally similar. In the UKMRC AML 10 and 12 trials, a FLT3-ITD mutation was associated with an increased relapse risk and adverse disease-free survival and overall-survival. While the standard induction therapy for AML has changed little in the last 20 years, a number of TKIs targeting FLT3 have been studied in AML patients as monotherapy or as combined therapy with conventional chemotherapy. Sorafenib, a multi-kinase inhibitor, was added to standard therapy in newly diagnosed AML patients younger than 60 in the SORAML trial. A total of 276 patients were enrolled and randomized to placebo or sorafenib during induction and consolidation. Median event-free survival (EFS) was 9 months in the placebo group versus 21 months in the sorafenib group. There was no difference in overall survival (OS). In the 46 patients with FLT3-ITD mutations, there was no clear benefit for EFS in the sorafenib group, but OS was improved (not reached vs 19 months). In the RATIFY trial presented at ASH in December 2015, 717 newly-diagnosed AML patients ages 18-60 with FLT3 mutations were randomized to induction with daunorubicin and cytarabine in combination with either midostaurin, a multi-target kinase inhibitor, or placebo. Midostaurin or placebo was then given with consolidation and for one year as maintenance. Complete response rates and adverse events were similar between the two groups. The hazard ratio (HR) for OS comparing midostaurin to placebo was 0.77 (Median OS 74.7 vs 26.0 mo). We await published data of the RATIFY trial and to assess if certain groups benefit similarly. Additionally, we do not know if a more targeted FLT3 inhibitor would be better than a multi-kinase inhibitor. While there is evidence that FLT3 inhibition combined with standard induction therapy is beneficial, no drug is yet approved. The standard approach would be 7+3 chemotherapy and allogeneic hematopoietic cell transplantation. Given the high rate of relapse for FLT3 mutated patients, it seems logical that allogeneic transplant would lessen the risk of relapse. However, there has been a paucity of prospective studies to support the conclusion. Earlier studies by Gale et al were unable to establish a benefit. In one of the largest reviews to date, the CIBMTR evaluated the impact of FLT3 mutations on transplant outcomes. In their analysis of 511 adults patients with de novo AML undergoing transplant, 158 (31%) had FLT3 mutations. There was an increased risk of relapse at 3 years in the FLT3 mutated group as compared with the wild-type group (38% vs 28%). However, there was no difference in non-relapse mortality, leukemia-free survival or overall survival. The European Group for Blood and Marrow Transplantation (EBMT) published their outcomes for 120 FLT3-ITD AML patients. Patients with the mutation had increased relapse risk and inferior leukemia-free survival as compared to WT transplant patients, but improved outcomes as compared to chemotherapy alone. Despite the lack of prospective studies, available data support the conclusion that AML patients with FLT3-ITD mutations in first remission should be offered allogeneic transplant when clinically appropriate. Medical History: Patient presented to the ER with one week of increased bilateral hip pain and fatigue. She had been seen at urgent care facility 5 days prior and was diagnosed with a UTI. She had a CBC at that time and was told to follow-up with a hematologist given her elevated white count of 63.8 K/uL; she was unable to follow-up due to insurance issues. She had no other complaints prior to admission. On physical exam, she was well appearing. Remaining exam was unremarkable. 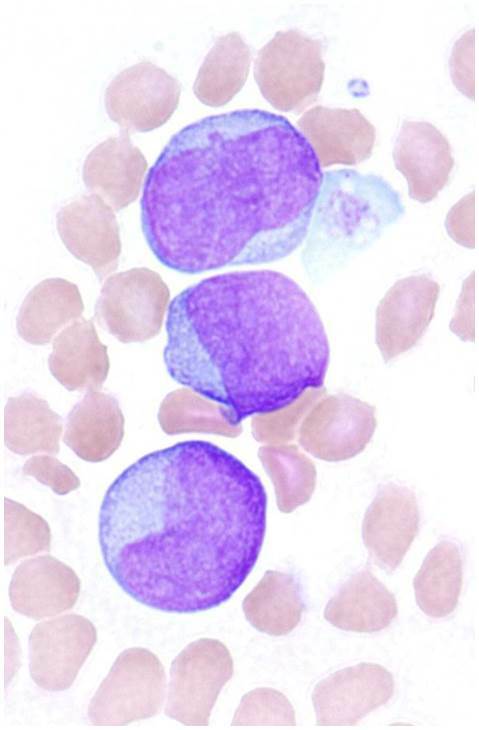 Review of peripheral smear demonstrated marked leukocytosis with normochromic, normocytic anemia and moderate thrombocytopenia. The vast majority of the leukocytes were blasts. Auer rods were not found. Rare nucleated red cells were noted. On her initial CBC, she had a white count of 115.8 K/uL, hemoglobin of 10.1 g/dL (MCV 95 fL) and platelets of 69 K/uL. On the differential, there were 1% segmented neutrophils, 1% lymphocytes, 1% myelocytes and 97% blasts. Renal and hepatic function were with normal limits. LDH was 471 with a uric acid of 5.4 mg/dL. Initial bone marrow was hypercellular (95%) with 89% blasts. The blasts had moderately abundant cytoplasm without granule and showed indented nuclei. Non-blast elements were minimal, but did not show significant dysplastic changes. The population coexpressed CD33, MPO, CD117 (dim) and CD 56 (dim) and were negative for CD15, CD34, HLA-DR, cTDT and FMC7 by flow cytometry immunophenotyping. FISH with normal probes for -5/5q-, -7/7q-, +8, 20q-, t(8;21), t(15;17), KMT2A (MLL) rearrangement and inv(16). NPM1 mutation present with 6.14E+02 normalized copy number. 2. What is your induction approach? 3. Does the NPM1 mutation alter your treatment approach? This case has features similar to Case 1, including a FLT3-ITD mutation, but also demonstrates a mutation in NPM1. Based on this finding, as well as the absence of a history of therapy, myelodysplastic syndrome or myelodysplastic/myeloproliferative neoplasm and absence of a myelodysplasia-associated cytogenetic abnormality, the case would be classified as AML with mutated NPM1, a subtype of AML with recurrent genetic abnormalities in the 2016 WHO classification (1). While mutations in NPM1 are considered to define an AML disease entity, it is now recognized that other mutations, including FLT3-ITD and DNMT3A, are common and must be studied in these cases to accurately determine the prognostic disease group (2-4). Cases with an NPM1 mutation that lack FLT3-ITD mutations have a more favorable prognosis than those with both mutations. The cup-like nuclear invaginations present in this case are common in cases with mutations of both NPM1 and FLT3 (5), but this finding is not sufficient to supplant molecular testing. Although not relevant to this case, it is worth noting that the 2016 WHO classification has modified the AML with mutated NPM1 category to now include de novo cases with multilineage dysplasia that lack a myelodysplasia-related cytogenetic abnormality. Such cases were considered AML with myelodysplasia-related changes in the 2008 classification, but have now been shown have the improved prognosis of the AML with NPM1 mutation disease group. 1. Arber DA, Orazi A, Hasserjian R, et al. Blood. 2016;127(20):2391-405. 2. Dohner K, Schlenk RF, Habdank M, , et al. Blood. 2005;106(12):3740-6. 3. Loghavi S, Zuo Z, Ravandi F, et al. J Hematol Oncol. 2014;7:74. 4. Cancer Genome Atlas Research N. N Engl J Med. 2013;368(22):2059-74. 5.Chen W, Konoplev S, Medeiros LJ, et al. Cancer. 2009;115(23):5481-9. This case is similar to the previous case except for two key features: our patient is 71, which precludes transplant at many institutions, and she has an NPM1 mutation in addition to the FLT3-ITD mutation. Given her age, her outcome is already poor independent of FLT3 status. The ideal regimen is debated, but given her lack of co-morbidities and performance status, many would advocate for standard 7+3. A clinical trial would always be preferred. Of note, the RATIFY trial did not include older patients. It is unclear if patients over age 60 would have the same benefit. Additionally, the toxicity profile may be different in older patients than younger patients. There appears to be some activity of the hypomethylating agents, decitabine and azacitidine, in combination with sorafenib. In a phase II study of 43 AML patients with relapsed/refractory disease or age > 60 refusing or intolerant of standard therapy, the response rate was 46% (all but one CR/CRi). Six patients were able to proceed to allogeneic stem cell transplant. Midostaurin and azacitidine have also been studied in relapsed and elderly AML patients. The combination was safe and tolerable, but none of the patients had FLT3 mutations. Quizartinib, a second generation inhibitor, is thought to be more potent than earlier agents. In a phase 2 study for patients = 60 years of age with relapsed/refractory AML, single-agent quizartinib produced a composite complete remission rate of 54% in the FLT3-ITD patients. Unfortunately, the median duration of response was 12.7 weeks. NPM1 mutations have been associated with more favorable outcomes. However, a recent report challenges the favorable classification in patients with AML > 65 years. There appears to be an interaction between NPM1 mutations and FLT3 ITD mutations. In a cohort of young adult AML patients, there was a beneficial impact of an NPM1 mutation on response rate and OS in FLT3-ITD patients. Several studies have analyzed the influence of the FLT3-ITD/wt ratio and demonstrated a high mutant allele/wt ratio was unfavorable. Schnittger et al characterized the FLT3-ITD status in 638 patients with NPM1 mutations. They were able to demonstrate the adverse influence of a mutated FLT3. However, only FLT3-ITD/wt ratios = 0.5 had a significant adverse impact on EFS or OS. Survival outcomes of patients with FLT3-ITD/wt ratios < 0.5 were not significantly different than FLT3-ITD negative patients. It is possible that patients with low FLT3-ITD ratios and NPM1 mutations may not need transplant. For this 71 year old, outside of a clinical trial standard 7+3 induction would be an appropriate choice. FLT3-ITD mutations are associated with a higher disease burden and decreased overall survival. The role of FLT3 inhibitors is evolving. The RATIFY trial reported a significant improvement in overall survival with the addition of midostaurin to induction. Despite the lack of prospective date, there appears to be a benefit to allogeneic transplant in first remission for patients with FLT3-ITD mutations. Thank you to Drs. Danielle Shafer and Daniel Arber for leading the discussion of this case and also to all of those who contributed to the conversation! The forum is now closed to further comments but users have the opportunity to claim credit on ASCO University by clicking here. Please check back in mid-December for a new case in this series related to gastric cancer.